Many French Muslims Find Lives Of Integration, Not Separation : Parallels Despite a minority suspected of holding extremist views, the vast majority of French Muslims say they feel fully integrated into society. France has the largest number of Muslims in Western Europe. 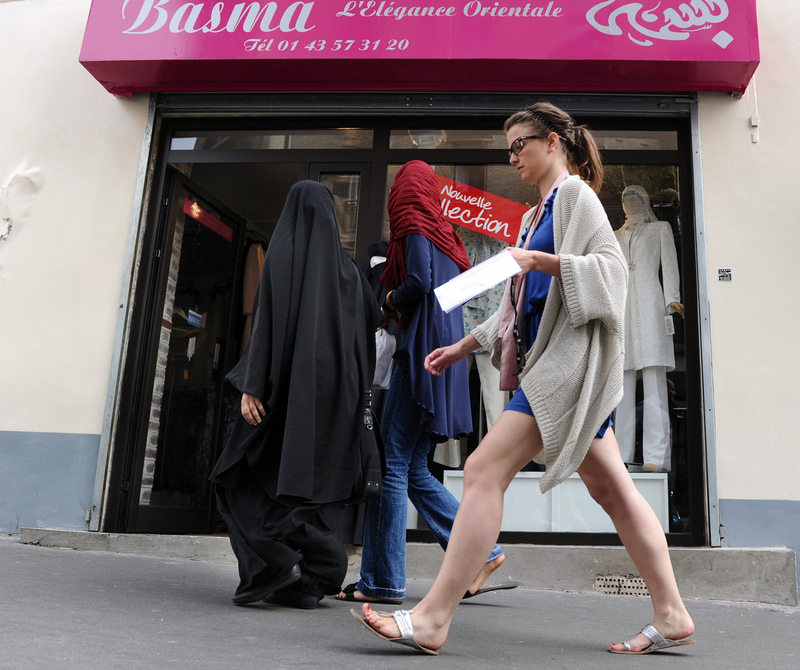 Three women, two of them partially veiled, walk past a hijabs shop in Paris. The wearing of the veil has been a serious point of contention in France, with the government banning its use in public schools and the wearing of face-covering garments, including burqas and niqabs, in public. Excited children shout out the answers during a Sunday afternoon Arabic class at the grand mosque in the Paris suburb of Argenteuil. The mosque has thousands of worshipers and is one of the largest in Western Europe. Aboubakar Sabri is a part-time imam there. During the week he runs a successful elevator-construction firm in Paris. Sabri came to France from Morocco in 1980 for doctoral studies at the Sorbonne, then stayed and raised three daughters. He says Muslims can live perfectly well in French secular society. Amira Bouziri is a 23-year-old journalism student who hopes to become a TV reporter. Her parents emigrated from Tunisia; she says she hasn't faced discrimination. "No one talks about Buddhists or Jews integrating," she says. "Why would it be more difficult for Muslims?" "We've succeeded in France, and we are totally integrated," he says. "Our kids attend the public schools. We love France. On Friday we say prayers for France, because if France is in good shape so are we. We are all in the same boat." These days there is a lot of talk about the couple hundred Muslims suspected of being involved in extremist activities — and about those who feel excluded from French society. But the fact remains that France has the largest Muslim population in Western Europe — a number estimated to be anywhere between 5 million and 8 million — and the vast majority are integrated into French society and helping shape the future of the country. Things have been tense since three self-proclaimed Islamist extremists attacked satirical magazine Charlie Hebdo and a kosher grocery store in Paris in January, killing 17 people. In jarring contrast to the children playing at the Argenteuil mosque, there also are three heavily armed French soldiers who now live there to protect the congregation. Sabri says everyone is glad to have them. There have been thousands of Islamophobic attacks around the country since the January attacks. Sabri laments that some people lump all Muslims together with what he calls "the crazy killers." Jamel Debbouz, a Frenchman of North African descent, is one of his country's most popular comedians and actors. But overall French media are limited in their portrayal of Muslim characters, television producer Amirouche Laidi says. Television producer Amirouche Laidi says the media plays a big role in stigmatizing Muslims, because they are underrepresented except when it comes to news or films related to Islamist extremism. He is working to show a more realistic representation of ordinary French people of Muslim background in films, advertisements and television. We watch a skit of French comedian Jamel Debbouz, a Frenchman of North African descent and one of the country's most popular actors. But Laidi says there are too few like him in France. "A country's media creates a sort of common, imaginary world, a view of how we all live together," he says. "The lack of Muslims on the screen, and the warped view shown of them is chipping away at our feeling of togetherness as a nation." Laidi says that could lead some French people who might not know any Muslims to believe that Muslim lifestyles are incompatible with the values of the French Republic — a notion he calls "completely false." Laidi, who is a second generation Frenchman with Algerian and Muslim roots, is also deputy mayor of the well-heeled town of Suresnes, west of Paris, and one of his duties is officiating courthouse marriages. He says statistics show France has the highest number of mixed unions between people of different religions and ethnic groups of any country in Europe. "France is a very multiethnic country," he says, "but you wouldn't know it watching television." Laidi blames the country's political elite for not understanding and taking the right steps to fix the problems. One of the biggest barriers to integration and social mixing in France are the banlieues — rings of housing projects around major French cities that are overwhelmingly populated by families who are poor, immigrant and Muslim. Journalism student Amira Bouziri says she hopes to be a TV news reporter. The 23-year-old, whose parents emigrated to Paris from Tunisia, says she never has faced discrimination. What annoys her, she says, is all the talk about Muslims and integration. "No one talks about Buddhists or Jews integrating," she says. "Why would it be more difficult for Muslims?" But Bouziri admits things might be different if she wore a headscarf, or lived in one of the public housing projects far from the city center. 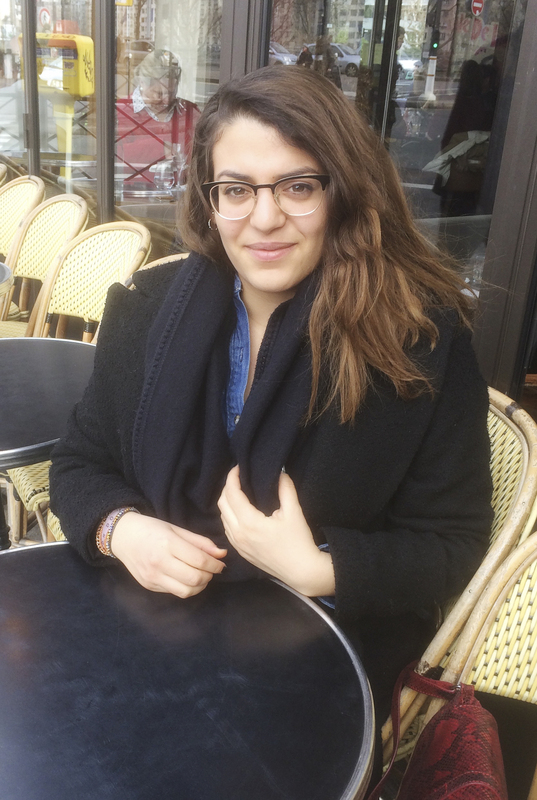 "I do think I'm lucky to be raised and educated here in Paris," she says. "I thank my father for that. He worked for the post office and was offered a bigger place on the outskirts of town, but he wanted to stay in the center of the city — even in a smaller apartment — for our education and for the city's cultural life." As a hard-working, born-and-bred Parisian, Bouziri says, she's always assumed she'll have the same chances as any other citizen of France.